AAFCS Public Policy Tool Kit (access through AAFCS Member Open Forum) – Learn what you need to know to advocate for FCS-related legislation. Includes About Congress, Preparing Your Case, Resources and Tools, Communicating with Congress and the Media, and Advocating or Lobbying? AAFCS/FCS Media Tool Kit (access through AAFCS Member Open Forum) – Educate the public about the valuable contributions family and consumer sciences professionals make to individual, family, and community well-being! Includes press release samples and templates, media tips, key messages, and more. Essential Effectiveness Tools in Support of Family and Consumer Sciences Secondary Education – Special compilation of information, strategies, and resources for use in validating and communicating the effectiveness of secondary Family and Consumer Sciences programs. Anyone can change the world. The first step is being informed. 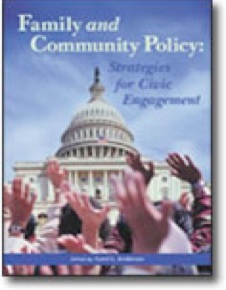 Family and Community Policy: Strategies for Civic Engagement offers a rich array of strategies for increasing citizen engagement in family and community policy. It is written for practitioners who are not satisfied with just thinking about and dissecting policy issues--it is for those who prefer action and results. Novices and seasoned pros alike should find this book informative and inspiring. For public policy questions, email publicpolicy@aafcs.org. For public relations questions, email pr@aafcs.org.